It’s probably not most people’s idea of the perfect working environment. 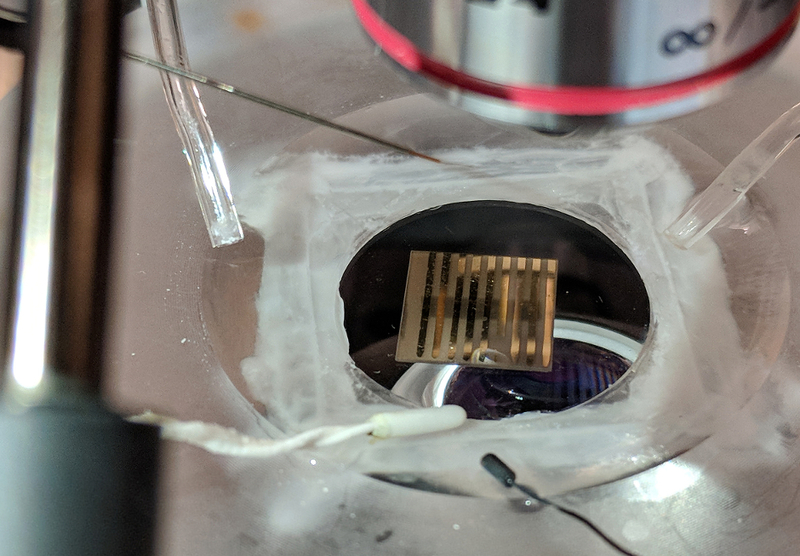 But when Dr Eric Schmieman looks out of his office window towards the ravaged reactor of Chernobyl’s infamous power station, he sees a project that he describes as the most technically rewarding of his life. Schmieman, a civil engineer from Pacific Northwest National Laboratory in the US, is currently senior technical advisor on what might well be one of the challenging and impressive engineering projects in the world today, the €1.5bn international effort to clean up the remains of mankind’s worst nuclear accident. Known as the Shelter Implementation Plan (SIP), the project is funded through the European Bank for Reconstruction and Development (EBRD) by 46 different countries and organisations. Since 1998, the engineers involved have worked their way through a long list of onerous challenges (see box), from stabilising the crumbling sarcophagus that was hastily erected following the 1986 disaster, to building the office blocks and associated infrastructure essential for such a long-running initiative. 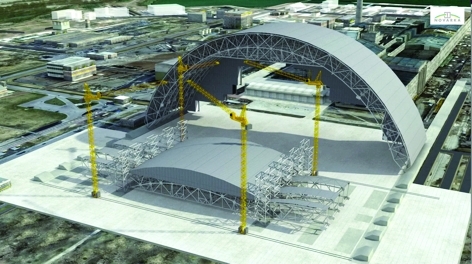 But the SIP’s crowning glory – is, without a doubt, the construction of the New Safe Confinement (NSC) – an immense steel arch, designed to last for 100 years, that will protect the sarcophagus from the elements, and enable engineers to safely and methodically tidy up a nuclear legacy that has troubled the world for the past 27 years. 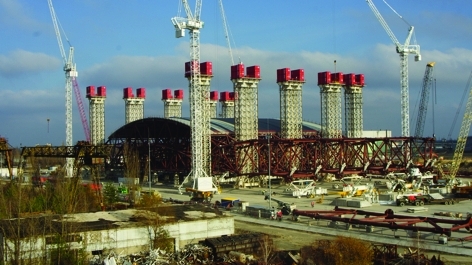 Standing 110m high, 250m wide, 150m long and weighing in at 30,000 tonnes, the NSC is currently being assembled 600m away from the damaged reactor where, thanks to the remediation work of the past two decades, the relatively low ground-level radiation dose levels enable engineers to work for upto 40 hours a week. If all goes to plan, at some point in 2015 the shelter will briefly become one of the largest moving structures on land as engineers begin carefully sliding it along vast tracks to its final resting place. Given that Ukrainian authorities have deemed the 30km exclusion zone around Chernobyl won’t be completely safe for another 20,000 years it’s perhaps surprising to learn that it’s safe to work at the site. But according to Schmieman the dose levels in the so-called “erection zone” are lower on the ground than those that he would experience in his office back in Washington state, where the local geology is responsible for far-higher doses of background radiation. Nevertheless, Chernobyl remains an exceptionally hazardous place. Many areas within the facility are completely sealed off, and dose rates close to the reactor are extremely high. ‘The hazard increases as you get closer to the source and it’s a deadly hazard if you get close enough,’ said Schmieman. Little wonder that a remote assembly technique was viewed as so attractive. 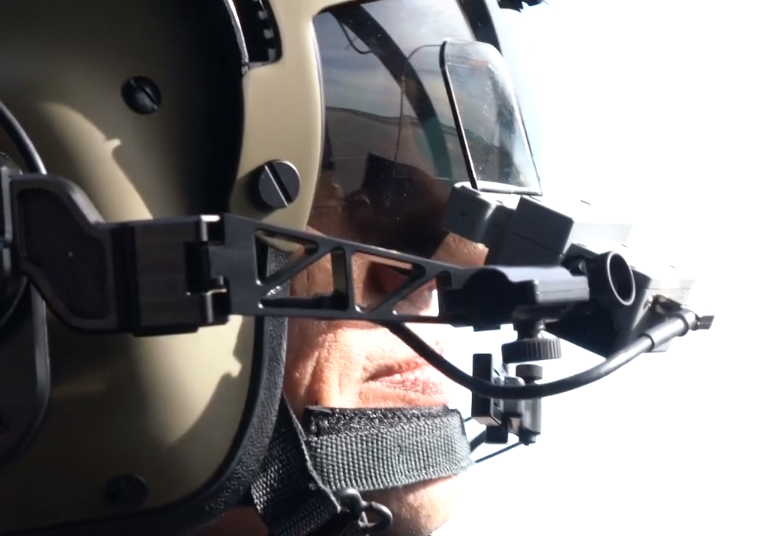 But this approach, though extremely elegant, doesn’t completely solve the problem. Because even 600m from the reactor, the dose rate increases at higher elevations. To address this problem, the engineering team has developed an innovative erection process which ensures that workers need never stray above the 30m mark. The jacks used to lift the arch are mounted on 10 specially built towers. Each tower has 52 cables hanging down, and each cable has a small hydraulic unit that is able to latch on, move a short distance, and lock itself in place. These can all be controlled to within a fraction of a mm, and are carefully controlled to move at precisely the same time in order to lift the arch correctly. Work is now well under way on the structure. 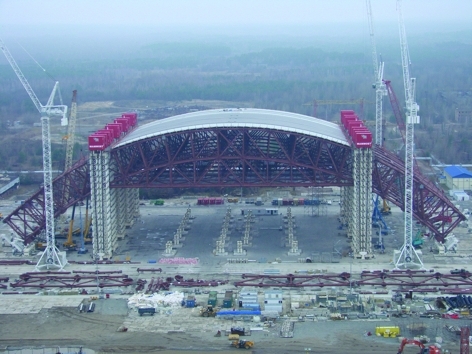 Last November, the first segment of the arch was lifted to an interim height of 22m and with the end of the harsh Ukrainian winter now in sight, Chernobyl’s international team of engineers is preparing to return. This spring, further sets of legs will be added until half of the arch is complete. Work will then begin on the identical second half of the arch, and ultimately the two halves will be bolted together. With the main structure assembled, the team will then turn its attention to the inside of the shelter, and the numerous systems and tools that will keep it safe and enable engineers to begin the deconstruction of the reactor. Perhaps the most impressive of these is a giant overhead crane that will be attached to the underside of the shelter roof. Known as a bridge crane – after the 96m long moving bridges that straddle six parallel tracks mounted to the NSC’s ceiling – this enormous machine, which will be wirelessly remotely operated, is currently being manufactured by US industrial robotics specialist PaR. The crane has three different carriages – or primary tools: a so-called classic carriage which features a hook on a cable that can be raised or lowered by a single drum; a secure carriage, which uses two drums, and will be used to move people around the shelter inside a shielded box; and a custom-made tensile truss system known as the mobile tool platform (MTP). The industrial equivalent of the complex cabling systems that enable TV cameras to swoop above the action of major sporting events like the Olympics, the MTP will be used to used to move tools and robotic devices in any direction within the shelter. Once the crane is in place the NSC will be moved into its final resting position around 600m away, a process that Schmieman anticipates taking around two days. The giant tracks along which the shelter will be moved are themselves a huge engineering achievement. At each end of the tracks – in the erection zone and in the final resting position (known as the service zone) – around 400 huge piles have been driven 26m into the ground. In the area in between these two zones there are no piles but instead a spread foundation that rests on the ground top. This is because, whilst the erection and service zones will experience prolonged horizontal reaction forces, the shelter will pass relatively quickly over the area in between. On top of these foundations sit the rails along which the NSC will slide on specially developed Teflon bearing links. 17m wide and the height of a two-story building, these vast concrete structures are topped with a stainless steel plate, mounted at a specific angle to ensure that the shelter can be accurately positioned. To achieve this the shelter is fitted with a hydraulic pawl and ratchet system – powered by diesel electric generators hung from the arch – that carefully moves the shelter along the rail and prevents it from running out of control. 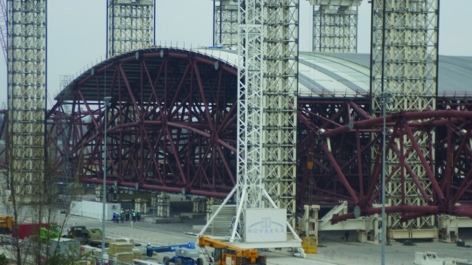 Once the NSC reaches its final resting place, the Teflon bearing pads are removed, and the weight of the structure will hold it in position. 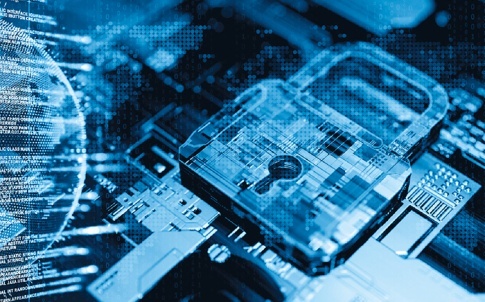 With the shelter designed to remain in place for at least 100 years, a host of monitoring and control systems will help to keep it safe and reduce the need for regular maintenance. And Schmieman’s team has devised a particularly elegant solution to the problem of corrosion. Instead, the outside of the shelter’s tubular steel structure is protected from corrosion by an air-conditioning system that circulates through the 12m space between the shelter’s tubular steel structure and its stainless steel cladding. This air is blown into the gap through large dessicant dryers, which remove moisture for the air and maintain it at less than 40 per cent humidity, a condition under which carbon steel will not corrode. This system recirculates around 45,000 m3 of air per hour, at a pressure around 50 pascals higher than the outside air to prevent areas of stagnation developing inside. The system also heats the air in the annular space to a temperature around 3°C warmer than the air inside the shelter. Incredibly, the NSC is one of a handful of buildings that will enclose a volume of air large enough to create its own weather. But by maintaining a temperature difference between the upper surfaces and the air within, condensation, and the prospect of “rain” falling on the shelter’s radioactive contents, will be avoided. Given the shelter’s hazardous contents, its designers have also equipped it with technology for monitoring both Seismic activity and radiation levels. Designed to withstand and survive earthquakes measuring 6 on the MSKscale (which is still widely used in Russia and former Soviet states) the facility is bristling with seismic moniotoring equipment. ‘We have a system of about 6 seismic monitoring stations in and around the site – as well as accelerometers and strain gauges mounted on the structure so that we’ll be able to see how it responds to any ground motion,’ explained Schmieman. It’s a capstone project. For a lot of engineers this must be like the guys who worked on the pyramids, you can’t think of working on anything much bigger than this. 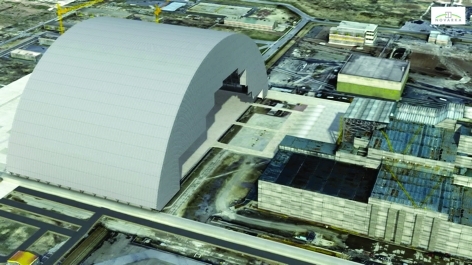 Once the shelter has been commissioned, the SIP project is formally over, and what happens then to the contents of the New Safe Confinement will be largely down to the Ukrainian authorities. Currently, Ukraine has no permanent facility for high-level nuclear waste storage, so it seems probable that that the hazardous material will remain where it is for some time to come. The NSC is the most expensive and final stage in a project which began back in 1998: the €1.5bn Shelter Implementation Plan (SIP). Before they could begin designing and building the New Safe Confinement, the engineers involved had to work their way through a list of over 22 separate projects. The biggest project to date has been stabilising the Sarcophagus, or “Object Shelter”, that was hastily built around the damaged reactor following its explosion on 1986. This has helped ensure that when the new shelter is in place, the engineers are able to dismantle the reactor in a controlled manner. ‘The main purpose of the NSC confinement is to take apart the destroyed reactor and its surroundings in an orderly fashion,’ said Schmieman. ‘If it were to be a disorderly pile of rubble, the cost in terms of radiation exposure to humans and the cost in dollars would be much, much greater. Isn’t Fukashima (GE design) a worse and ongoing nuclear disaster? Very little containment (flowing contaminated water), spent fuel rods that are horribly dangerous to move and “cores (3) through the floor”? Sure, if you choose to ignore Fukushima. Hey Jon! It’s Ukraine not “the Ukraine”. Acute radiation poisoning? 60 immediate dead. Unfortunately for the latest generations of Chernobyl and regional children born to parents, who as children themselves were subjected to much lower level radiation-they too suffer. It has been my sad privilege to assist the Dandelion Trust (and there are many others doing equally worthy work) both financially and in person with the ‘holidays’ they offer to these children: a month’s R&R in rural Wales. The children have a range of illnesses and problems: many related to damage started in the fetus and still growing. Poor or no teeth (at age 10),ear, hearing (and hence balance) damage, eyesight poor, if present at all, stunted growth, pale complexions, tenancy to catch and suffer from even the simplest colds and flu virus: I could go on. Support is given gratis by many local medical staff, but after a month, back they have to go to what is a totally hostile and tainted environment. And this was an accident! Heaven help our world (and ALL the people in it) that there are still persons -in posts of power- who actually believe that we should one day actually use weapons which would have a similar effect, in anger: or at least in retaliation. Nevil Shute’s “On the beach” the book and the film should be required watching. To the Anonymous commentators above: In addition to the great disparity in terms of immediate deaths when comparing Chernobyl to Fukushima Daichi, take into consideration that the amount of radioisotopes released into the atmosphere by the latter had a far smaller impact than that which was released into the Zone around Chernobyl/Pripyat. 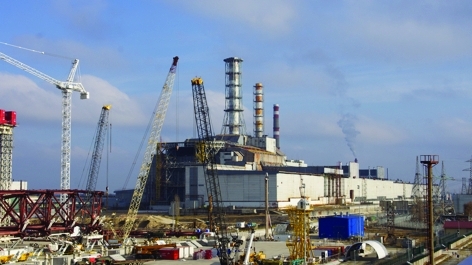 Experts put the figure at Fukushima at approximately 10% of the Chernobyl impact ( http://bos.sagepub.com/content/67/5/27 ). That report estimates that the risk of radiological illness to the local populace present in the geographical area at the time of the accident scales similarly (10% that of Chernobyl), however this doesn’t take into account the rapidity and range at which the Fukushima Zone was evacuated after the Tohoku tsunami (and, critically, before there was a radionuclide release of any kind), which reduces the health impact considerably – remember by contrast that Pripyat wasn’t evacuated until more than *36 hours* after the explosion. Given the half-life of each of the radioisotopes released at Fukushima is relatively short (Cesium 137 being the longest at ~30 years) relative to the uncontained radioactive substances at Chernobyl (uranium, plutonium, neptunium, Cesium, strontium, iridium, iodine, as well as irradiated graphite and the unknown constituents of the so-called Chernobyllium molten mass which collected below the reactor core). Also, the released radiation at Fukushima is orders of magnitude less than that at Chernobyl ( 900,000 Terabecquerels : 5 million terabecquerels), and the maximum detected radiation at both sites (72,900 millisieverts per hour vs. 300,000 millisieverts per hour). Bear in mind that at Fukushima, in spite of your claim to the contrary, containment was never breached as the pressure vessels remained intact, while at Chernobyl there was *no* containment. Finally, all of these facts and the safety procedures that exist now worldwide and at Fukushima in particular mean that the projected clean-up there will be complete in approx. 10 years, whilst Chernobyl will be an irradiated wasteland for approx. 100 years or more. Whilst the Fukushima situation is on-going, and has considerably worrying aspects regarding containment of irradiated water and staff safety procedures, and should be watched *very* closely, it can in no way rival the nuclear devastation that occurred at Chernobyl. To do so would be disrespectful to the ~60 confirmed dead as a result of the incident and the uncountable thousands of people, liquidators and residents, affected by radiation and evacuation. How nice to see some informed debate on the issue of nuclear power station accidents. As a total layman in this, it seems that citing “on the beach” as relevant is like linking modern transport to 19th century horses and carts. What stands out to me is that the nuclear incidents, while being terrible are nothing compared to the death and destruction involved in fossil fuels, e.g. mining accidents and oil-wars must trump the nuclear problems. Perhaps most importantly Nuclear power doesn’t actually threaten the planet ecosystem to anywhere near the same amount as green house gas energy sources do. As bad as Chernobyl was for the individuals – globally its of no significance. Whereas green house warming has significant impact on just about every habitat, including our own. The wild life at Chernobyl is doing just fine compared to areas such as the Great barrier reef! It may not be well known by fellow bloggers that Kursk is a city with pivotal significance to the former Soviet Union. It was the point, during the Great Patriotic War where the Red Army (with a little help from Ultra!) finally went onto the offensive, beating the Wehrmacht in the largest tank-battle ever fought and paving the way for the Red Army’s advance to Berlin. Kursk was the Leeds of Tsarist Russia: making yarn and fabric for suits and uniforms from the vast amounts of wool grown locally! It was in Kursk that I spent 8 weeks in 1971 assisting in the technical service necessary to run highly specialised and US made textile machines properly. These were to process acrylic material: the precursor for carbon fibres. Jack – kudos on naming the elephant everyone is ignoring. FF cost NY state (see http://www.thesolutionsproject.org) 3,100 plus air pollution deaths each year, and cost us over $25 billion (yes, with a B) in health care costs each year. I’m not saying nuclear is safe, but we need to stop grand exploitation of each catastrophe in that arena while we repeatedly downplay every mine fire and each oil spill, let alone the constant toxic burden that FF imposes. As for the broad picture, this video reaffirms for me that we need to stop implementing grand schemes while planning to deal with “minor risks” later. Front of the pipe thinking is imperative to avoid deaths, waste and ridiculous to-no-beneficial purpose spending. Rather a pity that no-one above seems to have congratulated the many engineers involved with the shelter on their achievements…?